This past month included the release of the BlackBerry OS 7.0 (shown on the chart in Yellow). While the 2.41% market share that the new OS showed in August is rather small, as a point of comparison it is more the double the 1.08% market share that OS 6.0 had in August 2010. OS 6+ meanwhile is now on just over one third of all devices with its marketshare up to 33.4% of in market BlackBerry devices. This data was taken from downloads of the popular BlackBerry strategy game Pixelated. 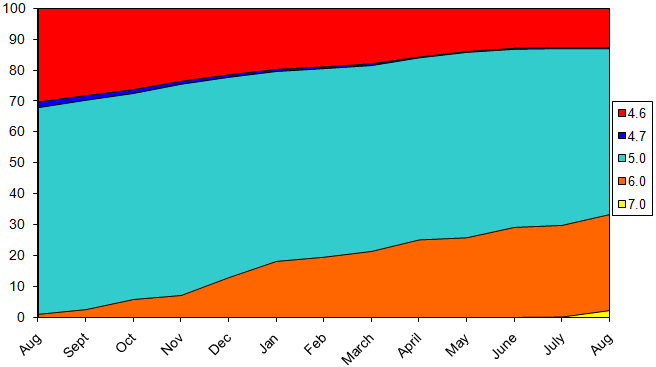 Data shown on the chart is from the beginning of August 2010 through the end of August 2011.